Picture for a moment an Argentine estancia (in American parlance, ranch), spanning 6,500 acres, in altitude varying between 3,000 and 4,000 feet above sea level, nestled in the Sierra Chicas of the pre-Andean Cordillera, the foothills of the Andes. The landscape is steep and open with granite outcrops punctuating lush pasture for horses and cattle together with such wildlife as foxes, hares, skunks and viscacha (the South American cousin of the badger) and the elusive wild boar, small deer and the Argentine wild cat, the puma. Bird life ranges from the brightly hued humming bird to vultures, eagles and the giant condor. Winters are short and dry with the days normally warm and sunny, with most of its rain failing in summer in fierce thunderstorms. Welcome to Estancia Los Potreros. (Potrero is Spanish for a field for grazing horses). Some nine years ago two Scot-Argentine brothers, Robin and Kevin Begg, expanded its brief from a cattle estancia supporting 1,000 head of Aberdeen Angus cattle, and horses for their management, to a paying-guest estancia offering trail-riding, hiking, picnics, bird-watching, swimming in rock-pools and, an optional extra, beginners’ polo. During Spanish imperial rule, from the 16th to the 19th century it was harnessed to breeding mules to work Peruvian silver mines. A century ago, the Begg’s paternal grandfather acquired and built Estancia Los Potreros, currently supporting 1000 head of Aberdeen Angus cattle. Following their schooling in England, his two grandsons worked in London’s financial services, Robin Begg as a reinsurance broker and Kevin as a merchant banker. Yearning to recover their roots, and invoking their bi-lingual fluency in Spanish and English, their parent companies invited them to open and manage branch offices Buenos Aires. That was until 9/11 when both offices were promptly closed. In the early years after World War II their widowed grandmother had opened the Estancia Los Potreros homestead to paying guests, tourists in search of an Argentina beyond the bright lights of Buenos Aires. From New Year’s Day 2002 the Begg brothers reclaimed that role. Where paying-guest estancias on the Argentine pampas offer horse-trekking on farm-roads as flat as ironing boards, Estancia Los Potreros riding trails are uphill and down dale, crossing streams and from plateaus viewing plains below and shimmering mountain ranges beyond. Of the estancia’s 140 horses, forty are breeding mares while the balance alternate between cattle-work, trekking and low-goal polo. As I can testify from personal experience, in temperament they are placid, responsive to the slightest signal by rain or heel, and sure-footed. You ride on light, fleece-lined saddles. Full-day treks with picnic lunches or camping out overnight can be arranged but the typical format for morning treks of three hours, returning to the homestead for lunch and 2 ½-hour afternoon, mostly at a steady walk. Riding parties are limited to six guests accompanied by two guides, of whom one is English-speaking, carrying water and a first-aid kit. Other activities within easy drive of Los Potreros are golf, dove-shooting and paragliding, together with Argentina’s second city, Cordoba, population 1.3 million, for the legacy of Spanish rule, a sublime splendid 17th century cathedral and churches built by the Jesuit and Franciscan Orders. The city is an hour from Buenos Aires by plane, offering several daily flights, and other air services linking Cordoba to nearby Latin-American capitals like Panama, Chile’s Santiago, Brazil’s Sao Paulo, Peru’s Lima and Uruguay’s Montevideo. The centrepiece of Estancia Los Potreros is its 19th century farmhouse and adjacent cottages converted to half a dozen twin-guestrooms with all the creature comforts we take for granted: en suite bathrooms and wood-burning stoves; a dining-room seating everyone at one table, leading in turn into a kitchen with all the modern amenities, and a drawing room, warmed by a log fire against the night cold, offering guests pre-dinner drinks and coffee served after. Your host at each meal is either Kevin Begg or his English-born wife Louisa. (Brother Robin continues a full but dormant partner, a regular visitor otherwise committed to business interests in Buenos Aires. Supporting the Beggs are three or four young people, almost all girls, all competent with horses and horse-care, all from Anglophone countries, on working holidays from three to six months, doubling as hostesses and horse-guides. Forty per cent of guests come from Britain with the US and other Anglophone countries accounting for much of the balance, with a ceiling of a dozen guests at any one time. Though couples come unknown to one another, mealtimes have the ambience of an English country-weekend house party. Furnishings, fittings and artwork, so far from paying homage to urban sophistication, celebrate, rightly so, the farmhouse’s rustic origins. Elsewhere in Argentina, families with estancias taking paying guests invariably employ managers while living elsewhere, typically in Buenos Aires. Guests at Los Potreros are introduced to Argentine rural culture by occasional concerts of folkloric music, song or dance, provided by local staff and their families or professional performers from Cordoba, while the estancia’s gauchos, the Argentine counterpart to the cowboy, can be seen breaking in horses or lassoing calves for branding. Estancia Los Potreros features in lists of the world’s best 100 hotels and resorts drawn up by the likes the London Sunday Times and the London travel magazine Tatler-Conde Nast. And beginners’ polo? Ten minutes’ drive from the guesthouse is the polo field. 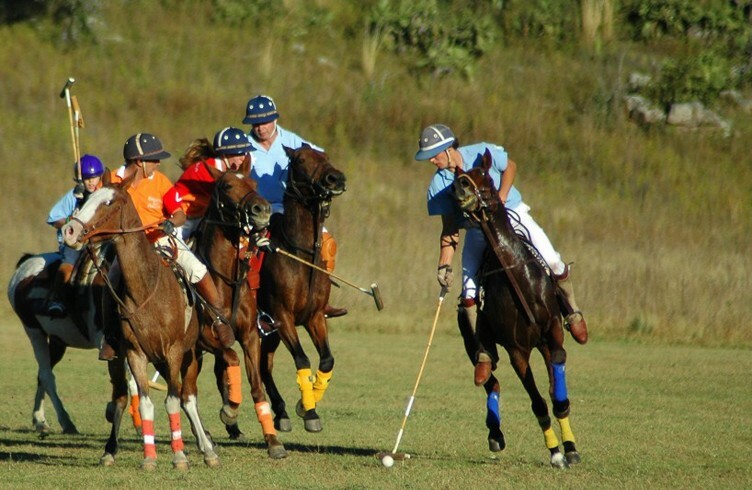 Polo at Los Potreros is an optional extra, not to be confused those, mostly but no tall in Buenos Aires Province, which promote themselves polo schools, admitting clients typically for a week or ten days expressly to learn the game. This year Estancia Los Potreros is offering three weeklong polo schools, of which two, in the second and fourth weeks of November, are still to come. Other polo weeks are possible outside those dates at the request of groups of between four and eight novice players. Polo week clients should bring their own helmets, gloves, riding boots and a pair of white breeches. Los Potreros supplies lightweight mallets and helmets together with seasoned mounts accustomed to novice players. Each polo week culminates in a weekend tournament in which, as at Pompeya Polo Club, novice players and local Argentine players. To conjure up the aura of an authentic tournaments, Los Potreros provides numbered, colour-coded shorts for players, a time-keeper signalling chukkers with a ball, the umpire in the traditional black-and-white striped shirt, and the rituals of the trophy to the winning team to which polo is beholden. During each polo week one day is assigned to visit nearby Pompeya Polo Club, which provides ponies for stick-and-ball and “friendly” chukkers blending novice players with local players. The club coach and manager, Mariano Martinez, the indefatigable Mariano Martinez, discusses polo across the gamut, from strategy to technique to horse care. I watched one such weekend tournament, a round-robin contest of three blended teams composed of men and women, boys and girls, ranging from 10 to 50 years old, of which it must be said some of the local children put their elders to shame. Following the trophy presentation, with novice from elsewhere and local players and their families who had come to cheer them on, some 60 people in all, sat at long trestle tables in the homestead garden, feasting on suckling pig, grilled asado-style, organically home-grown vegetables and with fruit to follow, washed down by local wines bottled especially for Los Potreros. Aside from polo, in which Argentina has no peers, thanks to its Italian heritage, it also excels in the pleasures of the table.